When this movie's trailer was shown many times during 3 or 4 months ago, I was rather intrigued to find out what it was all about. But then the trailer was never shown again and it seemed to be put on the shelf by the cinema chain in Indonesia. Until suddenly last week while my wife and I were on our staycation, I noticed in the cinema 21 website that it was already playing in some theaters. So yesterday we decided to see the movie at the 7.15 PM show. The cinema was a bit crowded but not fully booked. Anyway, we shall move on to the movie now. After having her relationship broken, Gloria (Anne Hathaway - The Devil Wears Prada, Brokeback Mountain and many more) returned back to her hometown where she met her childhood friend Oscar (Jason Sudeikis - The Angry Birds Movie, Horrible Bosses etc). With no money and no job, Gloria accepted the offer from Oscar to work at his bar as a waitress where she would meet with Oscar's 2 best friends Joel (Austin Stowell - Stratton, Bridge of Spies etc) and Garth (Tim Blake Nelson - Syriana, The Incredible Hulk etc). One morning, Gloria was informed of a very large monster that was terrifying the city of Seoul, South Korea. She somehow put two and two together and realized that the monster was linked to her. It seemed to be mimicking her behavior. As she was having trouble to keep this information to herself, she shared this fact to Oscar, Joel and Garth who naturally were very surprised. When Gloria realized that her actions would have put a lot of danger to the people of Seoul, she decided to take the matters in her own hands. However it would not be as easy as it would seem. Things got even more complicated when Gloria's ex boyfriend Tim (Dan Stevens - Beauty and the Beast live version, Legion and Downton Abbey TV series) came into the picture once again. So how could this monster be linked to Gloria? Would there be a solution to this and the Seoul people could be saved? Find them all in this movie. So, what could I say about this movie? I think the exact word would be it's weird. It was a weird movie that took too much time and sadly made the movie rather difficult to enjoy. The start of the movie seemed to be promising, but then it spiraled downwards after that. The characters build up felt too dragging and it made the movie lost its momentum. In my personal opinion, the movie seemed to be unclear of what kind of genre it was trying to show. Was it a monster movie? Was it a drama movie? Was it a comedy movie? Don't get me wrong, I am fine with combination of all which would result to, for example, lots of laughter, touching moments and intense moments. But this movie seemed to be lacking everything. And I think the movie also lacked a good soundtrack that would probably bring the mood up or down depending on the situation. It was a bit of a letdown actually since I was having high hopes. If you have seen the trailer to the movie, most of the funny moments have been shown there, so there were not a lot of laughs anymore in the movie that we could enjoy. There were bits and pieces of dark humor but that's about it. Now what about the monster itself? The good thing about it was the intriguing part of why it turned out in the first place and why it was linked to Gloria. It kind of make me wonder throughout the movie, though according to my wife, the reasoning was a bit illogical (or perhaps a bit forced). The climax of the movie to me was actually one of the very few good parts of the movie, apart from Anne Hathaway's performance here. And if I looked at the general consensus of what critics were saying, they were mostly praising her performance. Again, I think that the movie should have stick to one focus. For example the monster and its history, or the fun related to Gloria's "link" to it. Instead the movie chose to focus on the characters relationships plus the depressing condition of Gloria and it made the movie felt gloomy, not to mention its duration that was too long for such movie (1 hour 49 minutes including end credit part which did not have any end credit scene). 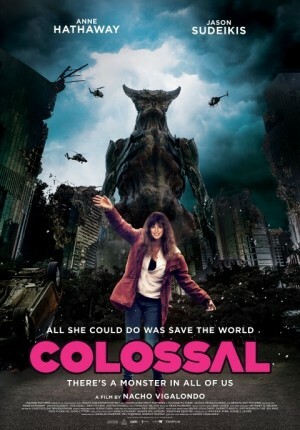 Overall, if you are looking for an intense destructive monster movie, or a funny monster movie then better look elsewhere as this movie did not offer any of those stuff. But if you just want to see Anne Hathaway's good performance as a drunk, out of job, no motivation and unclear aims in life character, then this probably would be something you can look forward to. The choice is yours.